When we talk about the traveling salesmen problem we talk about a simple task. Humans are good at doing this up to a point. Computers are not. 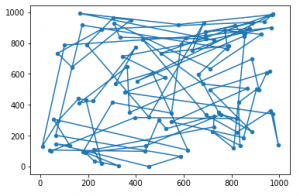 There are more efficient algorithms, but let’s assume we don’t have them yet. To solve even this simple 7 point problem we would have to check every possible path. Thats for all practical purposes impossible. 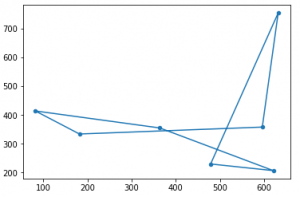 Why can a genetic algorithm solve this? We just add all the distances between the points and get the length of the route. The shorter the better. Some of that is more or less difficult. Well see it in detail soon. We need a little helper function. It just takes a numpy array a and deletes all values from it that are in b.
self.xymax = xymax #size of the "map"
This is a method to get the best routes. We do this for all routes and then return the best 50% in order(longest to shortest). The next step is mutating them. 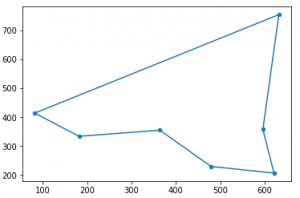 We use the mutation rate parameter which should be between 0 and 1 to switch out random points. We can’t just replace them as no point can be in there twice. 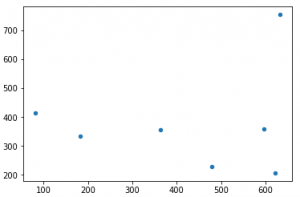 0.1 is a good value for the mutation rate. 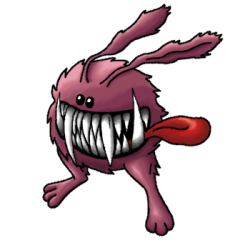 Also, there is a parameter “mutatebest” we use it to block the mutation of the best path. This makes sure we never get worse by mutation. Lets put it all together. The “verbose” parameter switches a best/worse line for each iteration. It sure looks good. But we can’t be sure it is the best. For more complex or multidimensional problems it’s the same. We use these algorithms until we have a solution that is as good as we need it. Ok. Your turn now. Try getting a really good solution for 100 points. 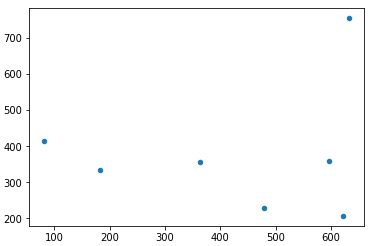 100 Points, 25 routes, mutation rate 0.1, 100000 iterations. 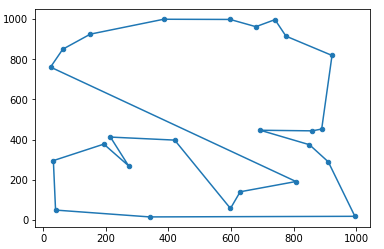 It’s not even close to optimal, but half the length of the random path. By now you might guess that each crossover is an error that might get solved if we let this run longer. Try to do better than me. The fitness function IS the biggest problem of it though so the simplest form: “O(NG)” that’s described there isn’t really giving you an answer that helps you out much. Optimization of the fitness function is the main priority when trying to optimize the performance. 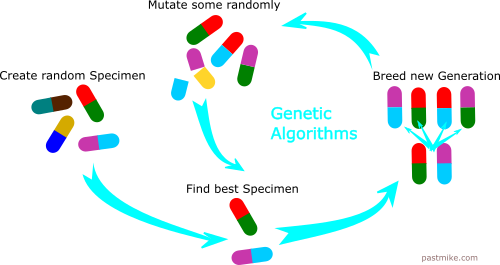 Previous PostPrevious What is a genetic algorithm?